Auxins include all those chemical substances which promote the growth of stems or coleoptiles sections and decapitated coleoptiles, but in same concentrations are incapable of causing the growth of a whole, undamaged plant. They occur naturally in the plant parts and are also chemically synthesized. The principal naturally occurring auxin is Indole-3-Acetic Acid (IAA) and Indole-3-Butyric Acid (IBA) is a synthetic auxin. 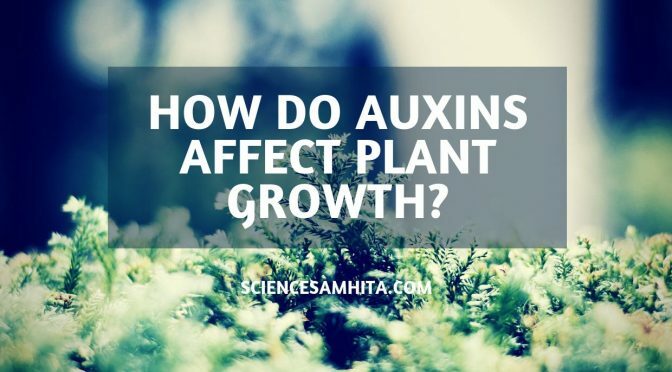 Auxins are powerful plant growth hormones (or plant growth regulators) produced by plants. They are found in the shoot and root tips and promote cell division, stem and root growth. Auxins are involved in phototropism, geotropism, hydrotropism and various other developmental changes. Causing increased wall plasticity with decreased elasticity. Interacting at the gene level by synthesizing the enzymes that are required for synthesis of the cell wall and cytoplasmic components. In many vascular plants, if the terminal bud is intact and growing, the growth of the lateral buds just below it remained suppressed. But, the removal of this terminal bud results in the rapid growth of the lateral buds. This phenomenon in which the apical bud dominates over the lateral buds and does not allow the latter to grow is called as apical dominance. According to Thiamann and Skoog (1934), the auxin synthesized in the apical meristem is translocated downwards and inhibits the growth of lateral buds. During the downward movement of auxin, some correlative inhibitors are also synthesized which inhibit the growth of lateral buds. Later, it was reported that this inhibitor may be beta-inhibitor (Abscisic Acid). More recent investigations suggest that auxin induces the formation of ethylene which functions as the real inhibitor. On removing the apical bud the influence of auxin is destroyed and the next axial bud grows out rapidly. Auxins are responsible for the initiation and promotion of cell division in the cambium. This effect of auxin is particularly important in the secondary growth of stem and differentiation of xylem and phloem tissues. Initiation and promotion of cell division by auxin is very useful in tissue culture experiments and formation of callus (i.e. an undifferentiated mass of cells). Healthy growth of cells depends on the auxin added to the culture. Auxins also promote root growth but only at extremely low concentrations. At higher concentration, they always inhibit root growth. A high concentration of auxin prevents the formation of the abscission layer at the base of leaves, flowers or fruits. However, this phenomenon is also controlled by the concentration of auxins and ethylene. Auxin is well known to induce parthenocarpy (i.e. the formation of seedless fruits without fertilization) in a number of plants. External application of auxins on flower causes the development of seedless fruits in tomatoes, apples, cucumber etc. Many synthetic auxins, such as 2,4-D (2,4-Dichlorophenoxy Acetic Acid) are used as selective herbicides (i.e. eradication of weeds). They are widely used as potent defoliants due to their destructive properties. There are many instances when these chemicals were used in chemical warfare due to their destructive properties. For example, Agent Orange, which is a mixture of 2,4-D and n-butyl ester of 2,4,5-T, was used as a defoliant in the war in Vietnam. Auxins regulate the activity of enzymes either by de-novo (a new) synthesis of enzymes or by the activity of already existing enzymes molecules. For example, they regulate the activity of peroxidase in tobacco cells and mung bean cotyledons. They stimulate the activity of wall-bound cellulose and glucose synthase in pea, bean and maize seedlings. Auxins generally inhibit the flowering but in pineapple (Ananas sativus), spraying of certain auxins initiates uniform flowering in the whole crop. They also help in delaying the flower formation in lettuce. The auxin induces an increase in respiration in many plants. This effect is thought to be related with the auxin-induced synthesis of various enzymes. The activity of these enzymes results in an increase in respiration. Ersek, K. (2018). What are plant auxins? And how do they affect plant growth? Available at: https://www.holganix.com/blog/what-are-plant-auxins-and-how-do-they-affect-plant-growth. Previous PostMesozoic Era – the Age of Reptiles.Next Post11 Algae that are Used as Human Food.